Tue., Feb. 14, 2017, 10:08 p.m.
PARIS – Two years after being humiliated by Barcelona in the Champions League, Paris Saint-Germain turned the tables on the five-time champions with a relentless display of skill, energy and determination. Angel Di Maria scored two superb goals and top scorer Edinson Cavani grabbed his 34th of a prolific season, with both players scoring on their birthdays as PSG battered Barcelona 4-0 in the first leg of their Round of 16 contest on Tuesday. Newly-signed winger Julian Draxler got the other one as PSG’s irrepressible front trio – a mixture of constant movement, power and pace – tormented Barca. Barcelona has grown accustomed to handing out football lessons, thrashing PSG 5-1 on aggregate when they met in the quarterfinals two years ago, but this was a PSG masterclass. Dreams of a sixth European crown should be put firmly on hold, because Barcelona has a massive task ahead in the second leg on March 8. In Tuesday’s other match, German side Borussia Dortmund missed several chances and a second-half penalty in a 1-0 defeat at Portuguese side Benfica. That result won’t grab the headlines like this emphatic result – one that sends a clear message that PSG is a serious contender this year. Di Maria, totally out of form for much of the season, celebrated his 29th birthday in style, rifling in an 18th-minute free kick and then skipping past two weak challenges before curling in a superb second from 25 meters (yards) out, 10 minutes after the break. Continuing his fine form since joining from Wolfsburg last month, Draxler smacked in the second goal late in the first half. Cavani, celebrating his 30th birthday, drilled home the fourth in the 72nd minute. “The understanding between the three of them was very high,” PSG coach Unai Emery said. The noise level at Parc des Princes reached deafening proportions as Barcelona cracked under waves of incessant pressure. Perhaps he was being diplomatic. Because although Barcelona was supposed to be the favorite, the night turned into a damage limitation exercise, the way it does when weak sides are totally outclassed. The way Barca lost its shape and composure was completely unbecoming of such a proud club. Luis Enrique’s side was destroyed by a PSG side playing with feverish determination, desperate to prove it belongs among Europe’s elite after falling at the quarterfinals in the last four seasons. This time it looks like the mighty Barcelona won’t even reach the last eight, after equaling its worst ever Champions League defeat. Emery vowed that his players were not scared of Barca’s famed MSN attack of Lionel Messi, Luis Suarez and Neymar, and would impose their game. Tonight was all about the CDD, as Cavani, Draxler and Di Maria ran the show. 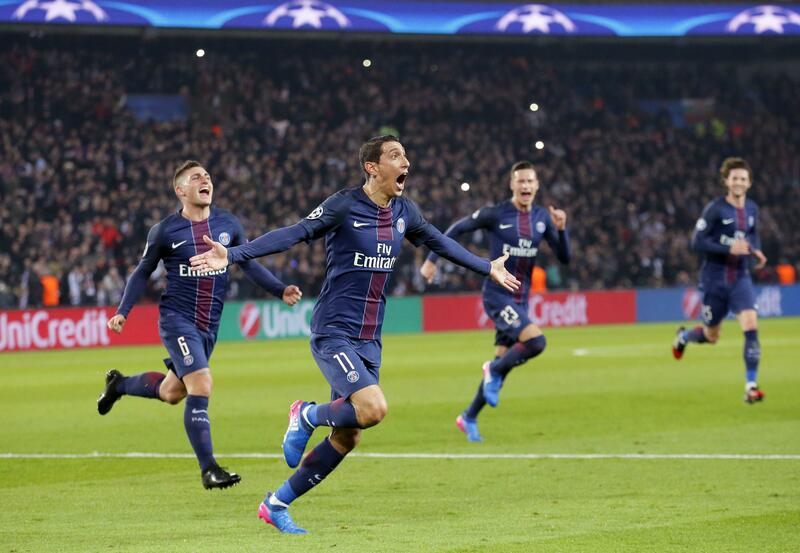 It was an unforgettable night in PSG’s European history. The side reached the semifinals only once, in 1995, the year before it won its only trophy, the now defunct European Cup Winners’ Cup. One PSG banner in the stadium read “Jouez comme des guerriers, vos soldats sont derriere vous” (Play like warriors, your soldiers are behind you). Led by the indefatigable running of midfielders Marco Verratti and Blaise Matuidi, and the craft of Adrien Rabiot, PSG closed down incessantly and caused havoc down both flanks. PSG took the lead when Di Maria spotted a gap in the wall and sent a fizzing free kick past flat-footed goalkeeper Marc-Andre ter Stegen. The high tempo and constant switching of play disrupted Barcelona’s shape, enabling a spare man to constantly dart in behind the back four. It was like watching Barcelona putting PSG to the sword two years ago. Published: Feb. 14, 2017, 10:08 p.m.